To the best of my knowledge, this is the procedure to date. If you want to become a citizen of Taiwan (R.O.C. ), this is the process you will need to go through, regardless of nationality. However, they may be some quirks in the process from the side of the country you are a national of before starting and during this application process. Some things I should clarify before getting into the actual naturalization process. Foreigners in Taiwan have residence in the form of an Alien Residence Card (ARC), Permanent Alien Residence Card (PARC, sometimes called an APRC) or a Joining Family Residence Visa (JFRV). The ARC is the most common and is applied for by an employer along with a work permit allowing a foreigner to legally work and live in Taiwan for the length of the ARC’s validity. Commonly, the ARC needs to be renewed each year. Generally speaking, after five years on an ARC a foreigner can apply for an APRC. The APRC is much like the ARC, except that you now have permanent residence in Taiwan, open work rights and no longer need a work permit. Anyone married to a Taiwanese citizen can apply for a JFRV at any time. A JFRV is fairly similar to an APRC regarding work rights, but become null and void in the event of a divorce or the death of the Taiwanese spouse. To be a citizen of Taiwan means that you have an actual ROC ID card. As an ROC citizen you obviously have all the rights and obligations of any other Taiwanese citizen, without it being dependent on a job or your relationship status. As good as this sounds, it is not a decision to be taken lightly as it comes with a few and especially one rather big sacrifice, depending on your perspective. The main obstacle for many foreigners in Taiwan in applying for and getting Taiwanese citizenship is that at the beginning of the process you are required to renounce your original citizenship before you can continue with the application process. Each country has different laws on this, and before even considering this move you should check with your respective government what their requirements and laws are regarding dual nationality and renunciation of citizenship (and especially resumption of citizenship, should you wish to do so one day). Applying for Taiwanese citizenship is not the best option for many people, and in most cases an APRC or even a JFRV would suffice. To get Taiwan citizenship, you need to go to your District Office (Qū Gōng Suǒ 區公所) and find the Household Registration Office (HHRO - Hù Zhèng Shìwùsuǒ 戶政事務所). They will give you a list of things you need (written in Chinese). The requirements may vary, but this mostly depends on how your country handles things like renunciations etc. The Ministry of the Interior only recognizes two classes of individuals who are applying for naturalization. 1. Individuals married to Taiwanese nationals (JFRV). 2. Individuals NOT married to Taiwanese nationals (ARC/APRC). The flowchart will be given to you by the HHRO in a booklet guide and will contain an English one, a Mandarin one (you should always reference the Mandarin one, as it is more correct and the one that the use exclusively for everything - the English one should only serve as a guide to understand the Mandarin one if your Chinese reading comprehension isn't that good) and several other language ones like Thai etc. You will use this flowchart often. It will, along with the helpful ladies at the HHRO, become your best friend and ally throughout the entire procedure. If you already have a JFRV, then you are set and ready to start your application process. However, if you are married and for some reason opted to stay on an ARC or rather applied for an APRC instead of a JFRV, then you would need to do the following if you wish to take the relatively easier route of applying on a JFRV (remember, your length of time on your JFRV is irrelevant, only the actual time you have been married, i.e. 3 years). Applications are to be done at your wife's household registration office. 5. If the foreign spouses are unable to return to the R.O.C. with their R.O.C. spouses, the foreign spouse is to submit his/ her Chinese name declaration certified by R.O.C. foreign missions. You take these documents to the HHRO and register the marriage. If you already have a JFRV, this step has obviously already been completed. The next step is applying for your JFRV (in the case of married folks who don't have a JFRV yet, or who are still on an ARC/APRC). If the applicant is not in Taiwan, the application is to be submitted an R.O.C. overseas mission. If the applicant is in Taiwan, the application is to be be submitted with the Bureau of Consular Affairs at the MOFA. 1. One set of the original household registration issued in the recent three months (with marriage registration certificate and the name of the spouse in its original/ foreign language). 2. Marriage registration certificate issued by the applicant’s government (marriage certificate for countries without marriage registration system, i.e. if you were married in Taiwan you will have to register your marriage in your home country first!). 3. A criminal record clearance/FBI report from your home country. 4. Qualified health examination certificate issued by the hospitals appointed by Department of Health or foreign qualified hospitals in the recent three months. 5. Passport (with validity for more than six months). 6. Two 2-inch photographs taken in the recent six months. Please note: Documents issued abroad have to be first certified (inspected) by R.O.C. foreign missions accompanied by Chinese translations (certified by the relevant district court). I also had to get them apostilled by the department of foreign affairs in my country of origin and certified by the Ministry of Foreign Affairs (MOFA) in Taiwan. 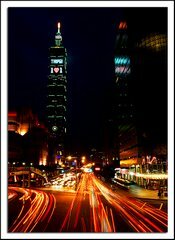 Applicants who are in Taiwan on visitor visas shall leave Taiwan should their visas expire. They are not to apply for residence certificates. Within 7-10 working days the Residence Visa should arrive. Take the relevant document along with the following to your local National Immigration Office (NIA). 1. One set of “Application for Residence Certificate for Foreign Nationals” is to be completed and submitted with two 1-inch photographs. 2. Passport and residence visa is to be submitted for inspection. 3. Application for residence visa stating reasons such as completion of household registration for marriage registration and certified documents is to be enclosed (Basically the documents you used in step 2 above, but I didn't need them a second time as the HHRO forwarded them - I asked them during step 2 if I could keep them and they said it isn't necessary. I advise checking with your HHRO during the application process during step 2 on this, but basically all I needed for step 3 was the application form, my passport, the residence visa I had just received and the application fee described below.). 4. Payment of residence certificate fee (NT$1,000, NT$2,000 and NT$3,000 for one-year, two-year and three-year periods respectively). Within in 7-10 working days you will be contacted to go and pick up your JFRV. It looks the same as the ARC/APRC, except that Reason for Residence has marriage next to it, and your address is your HHR address and not your work address. Step four onwards is the same for foreigners married to Taiwanese nationals and foreigners who are single or married to another foreign national. From step four onwards, please refer to the next section. 1. Five years of legal residence on an APRC or ARC, with no unbroken periods in that five year period. It is important to note that if you changed your visa from an ARC to an APRC or went from a student visa to an ARC or an APRC you start from zero and need to start counting your five year stay from the date of issue of your latest visa type, be that an ARC or an APRC. A JFRV holder is exempt and merely needs 3 years legal residence. 2. You will need to prove tax statements of the last year showing that you earned twice the minimum monthly salary in Taiwan. The “Basic Wage" is currently set at NT$19,047. Applications are submitted at your HHRO. 1. Application for “Certificate of ROC Naturalization Candidature” (including two photographs). 6. Certificates of sufficient property or professional skills to be self-reliant or to ensure personal sustainability (adhering to Article 7 of the Enforcement Rules of Nationality Act). ARC/APRC holders have to submit tax forms proving they have earned more than twice the basic monthly wage. JFRV holders don't need to do this step and need to prove they can support themselves, in my case a 服務證明書 fú​wù​ zhèng​míng​shū​ from my employer was sufficient. You can ask the staff at your HHRO what the require as individual situations may vary. AFAIK, if a JFRV holder is unemployed and is supported by their spouse that is fine too, but then the spouse needs to prove financial ability by means of a 服務證明書. 7. Household registration copy with completed marriage registration (can be enquired online by household registration agency).- applicants failing to submit household registration copy shall enclose wedding certificates, identification certificates of foreign and R.O.C spouses. If you got married in the ROC (as I did), you need to add a marital status certificate (a document issued by Home Affairs, or whatever your country calls it, that states you are married, and to whom), translated into Chinese with all the relevant authentications and apostilles. ARC/APRC holders do not need this, obviously. If the applicants’ countries do not require the certificate to abdicate their nationality, they do not need apply for the certificate. The certificate is issued within 7-10 working days if the applicant qualifies. Once you have the certificate in hand you will need it translated and certified and move on to the next step, renunciation. This step varies greatly from country to country. Some are easy and cheap, some are expensive and difficult, and some don't allow renunciation at all. In most cases you take the Candidature Certificate (translated into English or whichever relevant language and certified as needed) to your representative office in Taiwan (or wherever you contact your government for passports or consular services while living in Taiwan) and apply for renunciation. In my case, South Africa, I went to the South African Liaison Office in Taipei anf filled in an application form with my Canditature Certificate. I was assured it would take 6 weeks to complete, but it ended up taking 42 weeks. It is advisable to contact your relevant consular office before step 4 and find out what your renunciation procedures are as they have nothing to do with Taiwan. Once you have a Renunciation Certificate (and are effectively stateless) you can proceed to the next step. 1. Application for Taiwanese Naturalization (including two photographs ). 6. Police Criminal Record Certificate issued by municipality and county (city) government police bureaus during aliens’ stay in the R.O.C. 7. Certificates of sufficient property or professional skills to be self-reliant or to ensure personal sustainability (adhering to Article 7 of the Enforcement Rules of Nationality Act). 8. Certificates of the basic language command and requirements of Article 3 of Standards for Identification of Basic Language Abilities and Common Sense of National Rights and Duties of Naturalized ROC Citizens. 9. Household registration copy with completed marriage registration (can be enquired online by household registration agency).- applicants failing to submit household registration copy shall enclose wedding certificates, identification certificates of foreign and R.O.C spouses. Those marrying in the R.O.C. shall also enclose the marital status certificate of the foreign spouses translated into Chinese and authenticated by R.O.C. foreign missions. 10. Certificate fee of NT$1,000 (to be paid via postal money order with the Ministry of Interior as the payee). Numbers 4, 5, 7 and 8 aren't necessary as the HHRO already has them and they were used during the previous step. Also, number 9 is obtained by the HHRO on their computers if you're married to a Taiwanese national. If you aren't it isn't required anyway. Regular as clockwork, and as efficient as a German Brauhaus, your certificate of naturalization will be ready in 3-4 weeks (they will tell you 4-8 weeks). And on to step 7. 1. A Residence Application form (including one 2-inch recent colored photograph with white background). 2. Photocopy of the approval of nationality such as the approval for R.O.C. nationality table issued by the Ministry of Interior (the original will be returned after inspection), i.e. the lovely certificate you just got. 3. Certificate fee of NT$400. 4. Registered, stamped and self-addressed envelope. Again, regular as a teenager's bowels, you will recieve a beautiful certificate in the mail with 3-4 weeks (they say 4 weeks, but it gets there super fast). This certificate states that you are now a Taiwanese national. You take this certificate back to the NIA offices where they go through a drawer and hand you your 台灣地區居留證 Tái​wān​ dì​qū​ jū​liú​zhèng (TARC). Now you have to wait a minimum of 365 days before the next step. After a year you go back to the NIA offices, where the staff at this time already know you by name and treat you like an old friend ushered ahead of other people waiting their turn. 1. A Permanent Residence Application Form (including one 2-inch colored photograph with white background taken in the recent three months). 3. Valid transient record (有效之流動人口登記聯單 yǒu​xiào​ zhī​ liú​dòng​rén​kǒu​ dēng​jì​ lián​ dān​) - Basically a transient population registration form that, if I remember correctly, the NIA staff looked up on their computers. 4. Household registration (for singles, or those married to a foreign national) or citizen Identification Card of R.O.C. spouses issued in the recent three months (if married to a Taiwanese national you can use either or). 5. Health examination certificate certified passed in the recent three months (issued by Department of Health’s appointed hospitals and in compliance with Table B of the health examination items). 7. Registered, stamped and self-addressed envelope. 8. Certificate fee of NT$400. In 7-10 days you will get a confirmation letter by registered mail that informs you that you may proceed with household registration and application of an ID Card. On to the final step. 1. Residence Certificate from the Immigration Office to inform the applicant to proceed with household registration (that you just received via registered mail). In 30 minutes or so you should be done with your Taiwanese ID Card in hand. You are now a fully fledged Taiwanese citizen.